The iPad has quickly become an indispensable business tool. Businesses are looking to iPads apps to make their workers more efficient and solve critical business functions. Almost immediately IT, Marketing and the C-Suite are faced with the question - Can we buy an off-the-shelf app or should we build something from scratch? 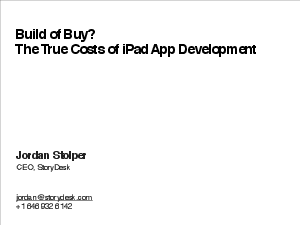 This white paper provides a useful framework to help you think about the true costs of building an iPad app vs. buying software off the shelf. It's written for non-technical executives and marketers seeking to realize the potential of the iPad while balancing concerns for cost and speed-to-market.